SHI’s Baby Raven Reads series offers culturally-based books for children up to age 5 and includes stunning place-based illustrations. SHI's Baby Raven Reads literacy program was named a Library of Congress Literacy Awards Best Practice Honoree, one of 15 programs in the world to receive the honor in 2017. This award-winning series was compiled and edited by Nora Marks and Richard Dauenhauer over decades. These are must-have volumes for anyone studying Tlingit cultures. Titles include Haa Shuka, Our Ancestors: Tlingit Oral Narratives; Haa Tuwunáagu Yís, for Healing Our Spirit; Haa Kusteeyí, Our Culture: Tlingit Life Stories; and Anóoshi Lingít Aaní Ká: Russians in Tlingit America. Learn to carve using SHI’s Tlingit Wood Carving series. This section includes other books, such as SHI’s Tlingit, Haida and Tsimshian place-names book and a photo book of SHI’s biennial Celebration. SHI’s online educational materials includes place-based curriculum in math, science, social studies and Tlingit, Haida and Tsimshian languages for k-12 students. SHI is a leader in developing and conducting cultural orientation workshops for teachers in Southeast Alaska in its effort to incorporate culturally-responsive teaching and learning into classrooms. Watch videos. Sealaska Heritage Institute produces curriculum and other education tools through its Education Programs. More language tools can be found on the language resources page. SHI's formline design kit and other tools to learn Northwest Coast Art can be found on the art resources page. Lingít X’éináx Áx! Hear it in Tlingit--A Tlingit Mini Phrasebook and CD: This material was adapted from Lingít X’éináx Sá! Say it in Tlingit, which was published by SHI in 2002. However, the CD offers new phrases and topic areas and allows users to hear the words. The mini phrasebook fits into the CD case, which holds two discs with audio covering 17 subject areas, including topics such as introductions, colors and greetings. Each track includes several phrases, which are printed in the mini phrasebook and recorded on the CD in Tlingit and English. The booklet was edited by SHI Linguist Keri Edwards and Tlingit speaker John Marks, who also narrated the Tlingit phrases on the CD, and Richard Dauenhauer and Nora Marks Dauenhauer, authors of Lingít X’éináx Sá! Say it in Tlingit. Tlingit is an American Indian language of Southeast Alaska and adjacent portions of British Columbia and the Yukon Territory. It is classified linguistically as part of the Athabaskan-Eyak-Tlingit language family because it shows clear similarities in grammatical structure to the Eyak and Athabaskan languages. These Athabaskan-Eyak-Tlingit languages are unique, carrying to exquisite heights an attention to the detail of the form of an object when determining how to use an accompanying verb. The Tlingit language itself is unique in four sounds that seem to be found in no other language on our planet. $20. Paperback & CD. Tlingit Spelling Book--Aan Aduspelled X'úx': This book is for learning to pronounce and spell Tlingit. It is designed for: (1) Tlingit speakers who want to learn to spell; (2) students taking a course in spoken Tlingit; and (3) adults learning Tlingit through self-study. This book can help teach children to spell Tlingit, but should not be used to teach them to speak Tlingit. The Tlingit Spelling Book complements Beginning Tlingit, and is recommended as an accompaniment. By Nora Marks Dauenhauer and Richard Dauenhauer. 4th Edition, Sealaska Heritage Institute Press, 1999, 52 pp., Oversized, with one audio CD. $26. Paperback & CD. Salmon Boy: Shanyáak'utlaax is a children's story that teaches about respect for nature, animals and culture. It comes from an ancient Tlingit story that was edited by Johnny Marks, Hans Chester, David Katzeek, and Nora and Richard Dauenhauer. Illustrated by Tlingit artist Michaela Goade. This book is part of the award-winning Baby Raven Reads, a Sealaska Heritage program for Alaska Native families with children up to age 5 that promotes language development and school readiness. You can also listen to Shanyáak'utlaax read aloud in Tlingit by Elder David Katzeek. A Basic Guide to Northwest Coast Formline Art: Art is integral to the life ways of the Tlingit, Haida, and Tsimshian. It surrounds us and it holds us up. Our Northwest Coast art is ingrained in the social fabric and oral histories of our clans. It is characterized by formline—a term used to describe the unique artistic style of the indigenous people of the Northwest Coast. Formline is a composition of lines whose widths vary to create form. The overall collection of these compose an image or design. The formline designs may represent stories of Raven (the Trickster), historic events, clan crests, or other concepts. Formline is an art that dates back more than two thousand years. In this booklet we aim to provide a concise and easy-to-understand guide for interpreting Northwest Coast formline art. - compiled by Rico Lanaat' Worl, Shaadoo'tlaa, and Donald Heendei Gregory. 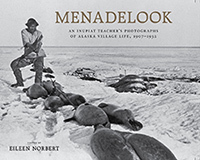 Published by Sealaska Heritage Institute in 2014. $15. Paperback. Doing Battle with the Halibut People: The Tlingit, Haida, & Tsimshian Halibut Hook: The most comprehensive book ever published on traditional northern Northwest Coast halibut hooks, known as náxw in Tlingit. Written by Chuck Smythe, Ph.D., the book delves deeply into the ingenious engineering, use of, and spiritual dimensions of the hooks as relayed by expert Native fishermen and members of the institute’s Council of Traditional Scholars. Scientists are only now realizing the genius behind the traditional halibut hook, which was engineered to catch only halibut and to perpetuate the species by targeting only medium-sized fish. In 2018, the Juneau Economic Development Council and the Alaska State Committee for Research (SCoR) inducted the traditional wood halibut hook used by the northern Northwest Coast Tlingit, Haida and Tsimshian into the SCoR Alaska Innovators Hall of Fame. The halibut hook was selected because it is a “sophisticated and innovative piece of technology unlike any other fish hook.”Published by Sealaska Heritage Institute in 2018. $15. Paperback. This video album features a series of videos made for educators as teaching tools to reinforce local traditions, customs, values and practices in schools and to show teachers and students connecting academic content with Alaska Native culture and language. Produced by Sealaska Heritage in partnership with SERRC, Alaska's Educational Resource Center.